Our mechanism for climbing the 6" step. 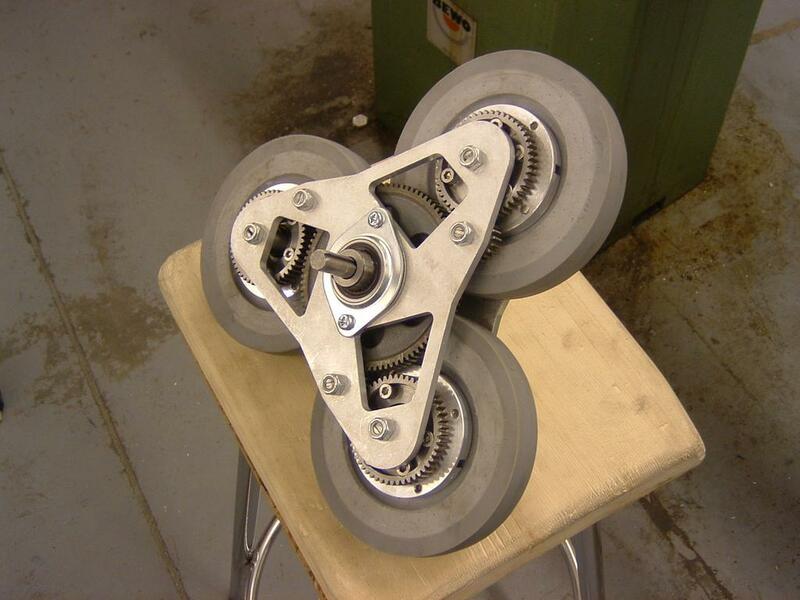 It consists of three 6" wheels, which flip over each other when the wheel is pressed against the step. Nice - using that to get on the platform? well i sure wish our team had enough enginuity to do that. it would take us the whole 6 weeks just to do the wheel and theyd still look like crap. we just hope that the pnuematic wheels being 2wice as tall as the platform and 4 wheel drive will be enough. us too. we got a bunch of sponsers in the last week. too late. cuz we made our design to be as cheap as possible. due to lack of funding at the designing stage. the money’s kinda going into our stomachs now. is it hard to turn with those? unless you have casters or transwheels on the back. i somehow doubt youll use casters tho. How many Tri-Star wheels are you useing? Not to be nit-picky or even discriminatory, but I’d imagine a team like your’s would be able to machine that a lot better. Personally, to me, it looks like the edges could of been done a lot better, but I don’t know if you intended it to be like that. I’m sure a lot of teams thought about doing this at one point or another, I know my team did in particular. But we realized that you can get up the stairs perfectly fine with 6 12" pnuematic tires (each at a different height to compensate each other of course). You don’t even need 6 pnuematic wheels. You can get up the step with 4 12" pnuematics. I might be thinking of the 8" pneumatic tires that came with the kit, not the 12" ones. Because I remember us trying to larger tires that came in the kit and with our drive train it actually went up worse. you can also get up with 6 6" pneumatic tires and a 9" piece of aluminum on a rubber band. That’s machined badly?!?! In that case, our robot is the embodiment of bad construction. Much of it is hacksawed lengths of various strips or pieces of bent sheet metal or aluminum extrusion. flat metal surfaces epoxied to plastic, motors mounted to diamond plate just because thats what we had lying around… That tri-star wheels is god-like compared to ours. Seriously, your so called quality of machining isn’t terribly important, in my opinion. Not every piece has to be CNC cut and then TIG welded. In many engineering jobs, there isn’t the time or the need for good looks and custom made stuff. Seriously, looks your so called quality of machining isn’t terribly important, in my opinion. Not every piece has to be CNC cut and then TIG welded. In many engineering jobs, there isn’t the time or the need for good looks and custom made stuff. You’re misunderstanding my statement. I didn’t say it was machined badly, I’m saying a team like that could of machined it BETTER. I’m talking mainly about the edges, personally if it was me, I would of made it more of a straight edge as opposed to being bumpy such as theres. I’m not sure if it’s meant to be like that, but seeing as how big the tires are, and what they’re trying to do, I’m just offering my opinion. I noticed that all the tri-wheels have the same “bumpy edges” and I believe they were designed like that. The sides are all the same too…also implying the general design. Who the heck cares how well they machined it? jeez… dont you have something on your robot to work on rather than nitpicking someone else’s machining? I think it looks pretty darn good myself, and I cant wait to see it in action. Good job 296! I’m not affiliated with their team in anyw ay, but I’d guess the reason for the edges is to give that gear a little extra support all around. The edges bow out slightly around the axle and then go back in probably to save weight. So now for some questions: CNC milled or waterjet? To me it looks like it was cut with a waterjet. Also- did you get the idea for the curve from a stress analyzation program? We had an engineer on our team once who had the software and allowed us to save all kinds of weight. Anyway, great looking part and keep up the great machining. Sorry for not replying sooner - I’ve been at robotics all weekend until now. Those wheels weigh ten pounds each, and we are using two in the front, with two six-inch wheels in the back. We actually designed the sides of the plates that way (not straight) , only because we found that the metal would touch the corner of the step while we were climbing it. It’s not a curve, just either two or three seperate straight sides that meet to form corners. We got the plates, shafts and wheel hubs machined professionally (I’m not sure what method they used, but the plates look pretty sweet up close). The turning is very good, considering all eight of our wheels are made of neoprene rubber.